The world of advertising has come a long way since the Egyptians used papyrus paper to create murals and posters. Thanks to technological advances, we’re now subjected to advertising at just about every turning. When we hop on the bus, when we scroll through our Facebook feeds, and even when we stream our music online. But because of this, customers are becoming increasingly de-sensitised by conventional advertising. Advertising can only be effective if consumers are attracted to it and engaged with it..
A billboard poster of a scantily clad model? Controversial full-page adverts in the newspaper? You can bet your bottom dollar that most people will simply pass on by without so much as a second thought as to what’s being advertised and by whom. Even the more ‘modern’ experiential marketing campaigns like flash-mobs are slowly becoming saturated, and your customers are losing interest. If you really want to stop people in their tracks with an experiential marketing campaign that packs a punch, you need to think about 3D pavement art. And anyone who’s ever seen the 1964 classic will have longed to jump into a piece of colourful pavement art, submerge themselves in a magical world and maybe even explore a whole new world. And thanks to the new 3D street art that is quite literally hitting our streets, it’s finally as close to a reality as you’re going to get! *Disclaimer*: We can’t make any promise that you’ll end up riding a merry-go-round where the horse comes to life and wins the National. For that you really do need a magical nanny and friendly, cockney chimney sweep! 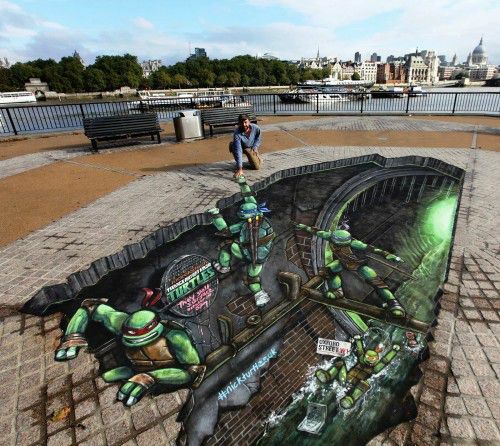 Pavement art has got seriously cool too. You won’t just see chalk sketches that took a few minutes to create, oh no! This new wave of street art features eye-popping 3D drawings; real optical illusions that transform the floor at your feet into a magical masterpiece. Pretty amazing, huh?! Could you imagine walking down the street or heading into your local shopping centre and being greeting with one of these?! You certainly wouldn’t forget it in a hurry. Heck, I bet you’d stop and take pictures and share those photos on your social media profiles. And if there were a sneaky bit of branding in there like the Teenage Mutant Ninja Turtles one, you’d remember the company too. Now imagine being the brand that was responsible for the experiential art. Imagine how powerful all those photos posted on social media would be for your brand. When it comes to making a brand splash in a prominent location, with a campaign that will garner free publicity – both in terms of conventional PR and crowd-sourced social shares – is a no brainer for any business. These kinds of drawings are always going to attract attention; so why not think of ways you can use it to attract attention to your business? The real secret though, is to make it look like you’re not advertising. Subtly is key here. You need to opt for a drawing and design that totally disrupts the customer journey and makes them stop and think. You want your brand to be there, for sure – like Nickelodeon is in the TMNT example above – but you don’t want to proverbially shove it down people’s throats. So when does art become advertising? The best 3d pavement artists, the best brands, are all creating striking, interactive and engaging campaigns that get people thinking differently. We’re so used to having advertising thrust in our faces, it’s these more experiential and engaging campaigns that are getting people spending. While the team at Street Advertising Services has been specialising in this kind of experiential marketing for a number of years, we’re in the minority. There are only a handful of 3D street artists in the world who are creating really awe-inspiring, jaw-droppingly good pavement art and advertising. In fact, the celebrities of this art form – Kurt Wenner Edgar Muller, Manfred Sader and Julian Beever – are all based outside of the UK making it even more difficult to see some really awesome examples close to home. But with years of experience, creativity, and a commercial mind to boot; Street Advertising Services creates street advertising in the UK with a bang! Call us biased; but we think that half the attraction of these drawings is watching a skilled pavement artist at work. Seeing how a few paint strokes can transform into a real work of art – if you stand at the right perspective point of course! 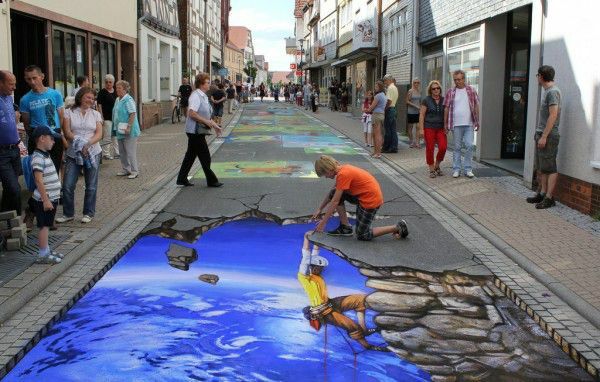 Who’s using 3D pavement art? Also known as anamorphic art or trompe l’oeil, 3D street art is fast becoming one of the most common methods of disruptive or experiential marketing. It fascinates, it engages and it allows customers to interact with brands in a totally new way. As one of the UK and Europe’s leading 3D street artists, we’ve been bringing stunning three-dimensional, optical illusions to life for our clients for many years. Using nothing more than chalk and bucket-loads of creativity; these experiential marketing campaigns transform a busy public space into an unforgettable advertising board. So, what brands are using this marketing method? While the UK streets might not be awash with these optical illusions quite yet, they are proving popular – and not to mention successful for the brands advertising – here at Street Advertising Services we’ve created our fair share of standout campaigns for a while host of clients. From leading yoghurt brand Muller to credit card provider American Express; the new King of experiential advertising really does work for every client. But our client base doesn’t just end there. You see some more examples of the pavement art created by our amazing 3D street artists by visiting our 3D street art gallery. No matter what you sell or who your target market is; if you want to get ahead of the competition with an advertising campaign that quite literally stops people in the street, then you need to seriously consider getting the chalks out. We know the question isn’t “Can it work for me?” it’s more like “How...”. As long as you’re clever, creative and have the right team behind you, 3D street art really can advertise your brand, your products or your service. The only real concern is making sure it doesn’t rain and wash away your design! Think outside the box – The key with experiential marketing and advertising such as this is not to stick with the norm. Otherwise it’s a wasted effort. Instead, think about clever, cool, creative or even controversial ways you can advertise. After all; pavement art will stop people in their tracks and get them talking. You need to give them something to talk about. Integrate your marketing – Any good marketer knows that consistent and integrated advertising is the key to success. It takes customers as much as eight times seeing a marketing message before it sinks in, so you need to make sure any pavement art you create syncs and relates to other campaigns you’re running in some way. Choose a prime (and relevant) location – Advertising in this way can potentially reach hundreds – if not thousands – of prospective customers if you choose the right location. Research high-footfall areas where your ideal customers are likely to be, and choose a design that works well with this. It’s also important to say here that you’ll need to get permission from the council and other powers that be here; we don’t want the book thrown at us for graffiti! Work with a professional – Unless you’re Banksy, we wouldn’t recommend getting the chalks out yourself! Work with professional 3D pavement artists to ensure that you have a well-executed advertising campaign that looks the very best it can. It can be really damaging to your brand if you launch a poor campaign, and it’s the bad drawing that people will remember – not the message behind it! Don’t just draw and leave – An advertising campaign is only a success if people know about it. You wouldn’t run an event and not invite anyone would you? The same goes for street art. Do all the background work to draw people to it. Write a press release, post teasers on social media, and then share pictures on your blog and website. If you create a big enough buzz, you can get people turning up just to see your latest advertising campaign! As with any marketing or advertising campaign, you can’t expect to get it spot on first time. In fact, you may even have to get a few things wrong and jump a few hurdles before you really see the fruits of your labour paying off. But it’s so worth it. Call us biased, but we think that – if you want to make an impact with experiential marketing – 3D street art really is the way to go. So channel your inner Bert the chimney sweep, and see how something as simple as a chalk drawing on the pavement can completely transform peoples’ perceptions of your business. In the Internet age, it’s important that brands cut through all the noise and really stop their customers in their tracks. Sending messages to their smart phones and laptops will only get you so far. We’re becoming increasingly desensitised by conventional marketing and something’s gotta give. Successful marketers need to find new ways to grab their customers’ attention at times and in ways they’re not expecting. Traditional advertising isn’t dead – far from it – but we do need to think of ways we can stand out from the crowds. Experiential marketing and advertising campaigns put the power back in your hands. They not only give you an exciting new platform to promote your products, but help you connect and interact with your customers in a completely new way. And that’s what modern marketing is about. It’s a two-way conversation; not a monologue. 3D pavement art is intriguing and interactive; it provides a tangible way for customers to discover more about your brand. It engages with all the senses and helps to bring your brand to life in a new location and a new way. 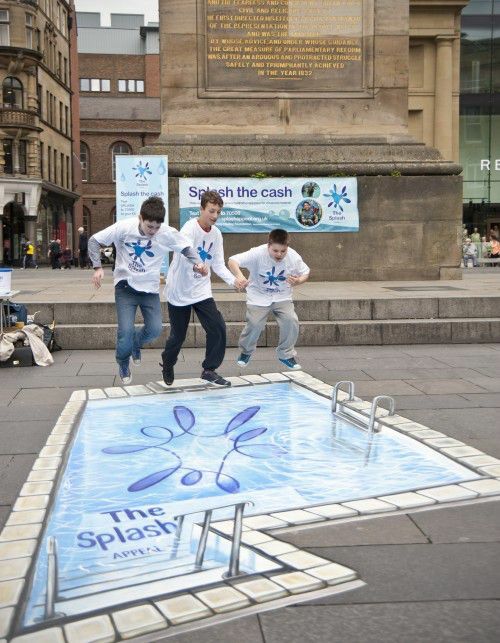 So forget flash-mobs; we’re calling it – street art of the 3D variety is the new King of experiential marketing! To see how Street Advertising Services can create eye-popping 3D pavement art for your business, contact us today.